Femta is an award-winning innovative program for women to keep track of their menstrual cycles. Femta calculates the probabilities of becoming pregnant for every day and displays them in charts and a calendar. You can easily record information on your menstrual cycles, pregnancy, childbirth and lactation. Femta helps you to predict future cycles. It is the only application that gives you all of these great features: a very easy to use interface; the perpetual calendar with possibility to display from 1 to 36 months simultaneously; five types of charts, calculated using the data of your past periods; easy browsing of the calendar and charts; synchronized moving on the calendar and charts; convenient viewing of your periods and the calculated data in the calendar; easy to record or change dates of your period in the calendar; fast access to all important functions from the pop up menus, tool bar or main menu; automatic checking of possibility to record a period at chosen date to prevent mistakes. 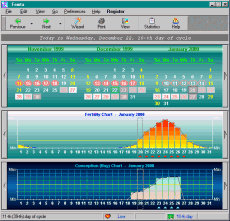 Femta is very configurable: easy to change any colors of the calendar or charts; easy to change the fonts of the calendar or charts; a lot of settings for displaying the calculated data; different forms for changing of preferences of the calendar, charts, and general settings; preference forms contain the calendar and charts with the real user data; immediately view changes in the calendar and charts; several predefined color sets; user can create and save custom color sets; easily hide or show charts or other program objects; automatic saving of the configuration; the easy-to-use Wizard with explanation of all user actions; WYSIWYG Print preview with a lot of possibilities; undo the last actions; possibility of using a start-up password for user privacy; compatibility of the Femta database between versions and easy upgrade to the newer versions of Femta; context sensitive help from anywhere in the program; easy and thorough installation/uninstallation program.